In the world of sunglasses, the rule of thumb for any woman who is as equally style-conscious as she is skin-conscious: bigger is better. Yes, you of course need lenses that block out damaging UV rays to protect your eyesight, but the bigger the frames, then the more delicate skin around your eyes—where all those so-called crow’s feet pop up—will be protected as well. “Larger sunglasses can protect the lower lid from skin cancer, but in terms of vanity, they can also prevent UVA damage which leads to wrinkles and crow’s feet,” explains New York City cosmetic dermatologist Dr. Gervaise Gerstner. Thankfully, large frames are always chic, from a timeless Jackie-O style and trendblazers like Victoria Beckham and Beyoncé. So which oversized sunglasses should you consider this summer? Try these on for size. 1. FENDI Embellished Cat Eye Mirrored Sunglasses, $450. This Fendi pair lends an art deco vibe while still looking completely modern. These sunnies add instant chic to any ensemble. 2. Gucci 59mm Oversized Square Sunglasses, $315. For the classic girl, one can never go wrong with tortoise oversized Gucci. 3. Dior ‘Mohotani’ 58mm Cat Eye Sunglasses, 315. For a sophisticated, ladylike vibe, these Dior cat-eyes help create the illusion of a lifted, more youthful face. They’re available from traditional black to vibrant purple for the more daring. 4. Lumete Eyewear Ulula, $245. A favorite of Dr. Gerstner, the wide arms of these gorgeously sculpted sunglasses protect the sides of your face from sun exposure, but thanks to their curves, aren’t overbearing on a petite face shape. 5. Tom Ford ‘Raquel’ 63mm Oversized Open Side Sunglasses, $395. These chunky, oversized glasses are the perfect pair for going incognito while still demanding heads to turn. 6. 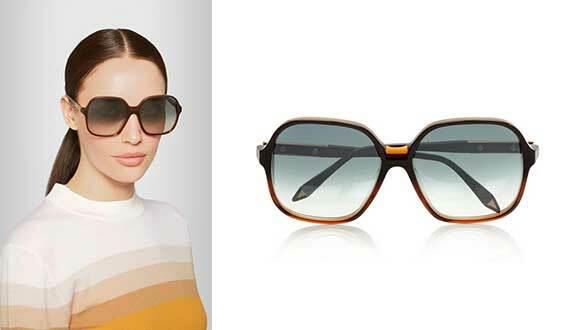 Victoria Beckham Square-Frame Sunglasses, $535. These are a favorite of Charlotte’s Book founder Robin Shobin. “I love the shape, which is square but not harsh, and the gradation of the lense color is very chic,” she says. Samantha Brown is a celebrity stylist with credits and collaborations that include Nylon, Badgley Mischka and Gilt Group. She has been featured on ABC News and Good Morning America and is a staple during New York Fashion Week. She helps her personal clients discover their own "best dressed" style.